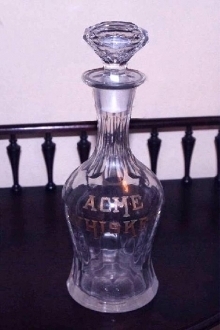 Acme whiskey bottle/decanter. This glass back bar whiskey decanter reads ACME WHISKEY. A fine advertising item from the late 1800's to early 1900's. The decanter stands about 12" tall, has the original top and is in very nice condition for its age.